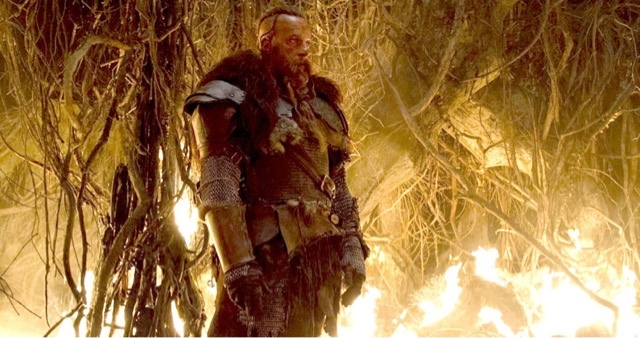 The Last Witch Hunter (2015) film review. Atmosphere Productions, One Race Films, Goldmann Pictures. Directed by Breck Eisner. Distributed by Summit Entertainment US, Entertainment One UK. Rated R US, 15 UK. Running time 106 minutes. This film completely surprised me, I was expecting the usual action film fest, with a little fantasy thrown in, and yes it does deliver on these fronts, but is an enjoyable film. Why did I like it? the whole medieval thing early on, reminded me of Game Of Thrones, with Vin Dielsel's character with hair, full on beard with his band of mercenaries to avenge the death of his wife and child to this very dangerous witch. From the outset I realised how violent it was, I thought a bit much for a 12 rated film, it turns out it is 15 rated movie, or R rated stateside, with a very scary witch, and a great opening segment to the film. 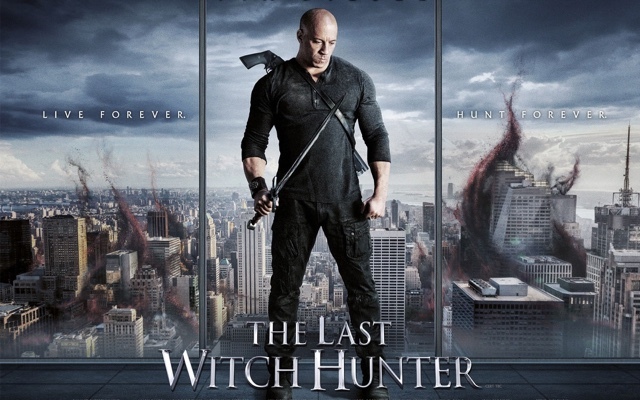 Kaulder (Vin Diesel) slays the Witch Queen who killed and cursed his family, to only be cursed in her dying words, to give him ever lasting life. He uses his curse to help the Catholic church's fight with all things dark and evil for centuries. to only have the Queen return once more to rule the Earth with her darkness and black magic, and to bring hell on earth. Can he stop her? with all the souls of previous witches he slayed on her side. As I said I enjoyed this movie,Vin Diesel is a huge brooding presence onscreen, he does look good onscreen, and for people to say he cannot act is a little unfair, the only problem I have with Vin, apart from the crappy Fast And Furious series, is that I cannot ever understand what he is saying, he mumbles throughout this movie, I had to put on subtitles to understand what his very bass voice was saying, but that in fairness that was a minor floor in this movie, as luckily there is few lines of dialogue he has to say. Alongside him for the ride is an underused Michael Caine, Elijah Wood, and to tie in the whole Game Of Thrones things, English actress Rose Leslie stars in this also, in which she is actually really good. The movie does run along at a decent pace, with great support from Rose Leslie as Chloe a witch who can dream walk, and place ideas, steal thoughts, or even kill someone in a dream state aka a Freddy Krueger. With some quite scary sceens, especially the make up on the witch, is really good, to the final battle, between Kaulder and the Queen. This film will not win awards, the acting by some is not the best, but you know for an hour and a half it grabbed my attention, with its sorcery fighting swordplay, with it being a cross between Game Of Thrones meets Vikings, with a little Constantine thrown in for good measure. Yes It ain't orginal but you know I don't care I enjoyed this.